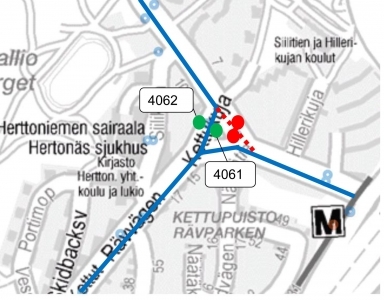 Helsinki internal routes 79, 81, 90N and 802 will be diverted to run via Kettukuja from 2 February. The "Kettukuja" bus stop (4179 and 4180) on Siilitie will not be served. Instead, buses will use stops 4061 and 4062 on Kettukuja. Siilitie will be closed to traffic due to excavation work. The diversion will remain in place until the end of the year.